Are you using Instagram to connect with your audience? And if not, should you? Okay, that’s a loaded question. Statistically speaking though, it makes business dollars and sense. Scan these Instagram stats that show its breadth and depth worldwide. Then use them to shape your Instagram marketing strategy. Who’s using Instagram? So nice of you to ask. Well, over an eighth of the 7.6 billion people on the planet (and counting). A look at some Instagram user statistics to keep close to your marketing cuff. Of the social networks, only Facebook and YouTube have more people logging in. With 500 million of them using Instagram—every day. Want some of them to like your business? Click here to for some tips on how. 2. 80% of users are outside the U.S.
That’s a whole lot of global ad revenue for your products and services. With estimates of almost $7 billion in mobile ad revenue in 2018. Interested in doing business in India, Brazil, Indonesia, Turkey, Russia and Japan? Go for it. Tens of millions of active users for your global products. Women more than men are using this photo sharing app. But the gap has decreased slightly the past couple years. …between 18 and 29 years old. Conversely, 33 percent of Instagram users are between 30- and 49-years-old. Another thing, 70 percent of U.S. users have a post secondary education. Now go slice and dice your marketing campaign accordingly. Only second to Snapchat. Yet, 63 percent of 13- to 17-year-olds use Instagram daily, compared to 54 percent for Snapchat. Less users, more engagement on Instagram. All there for you to influence these young-uns with your t-shirts, bracelets, songs, videos, or whatever they like these days. …followed by Facebook at 91 percent, and Snapchat at 60 percent. So what, you say? Tell a coherent story for your brand across these platforms. A nice bundle waiting to hear from you. Quite a few user stats so far, eh? Some more, consolidated. To keep things simple. Speaking of statistics… want to see what your business’ Online Visibility looks like? Click here to do Luce Media’s free online visibility test. How are people using Instagram? Another great question. Let’s learn some of the hows with these Instagram user statistics. Compared to 24 minutes per day for 25 and older. This is more than before. Why? Instagram stories. They make it easy to add a creative flair to any photo or video. You can do the same for your business. …making Instagram the happiest place on the internet. And that was in 2016 when there were only 500 million Instagrammers. Is your brand feeling lonely? Get on the ‘like’ band-wagon to make new business friends. And that was in 2016. Surely, a (large) portion of that action is open to your products. What are you waiting for? Up from 300 million in October 2017. Most brands (2 million of them) are telling their stories with Stories. Over 50 percent one month in 2017. With a third of the most viewed Stories created by businesses. It’s pretty obvious Stories work for brands unless you’re not telling any. …while the number of videos created each day quadrupled from 2017. Yup, users love their video posts, right from the start. When they launched in 2013, 5 million videos were uploaded in the first 24 hours. Create and run a campaign to feed these video-carnivores. Why use Instagram for business? Because it’s already proven to be business-worthy. As noted by these Instagram business statistics. Whether for the global enterprise, or for your mom-and-pop business. …edging out Twitter, which has plateaued. But not Instagram. Things are still and will continue to heat up for this personal and business platform. And over 200 million users visiting at least one business profile every day. From clothing to concerts, lingerie to linguine. Including fashion brands, 96 percent of them are on Instagram. Got something to sell? Instagram has people to target. This is a great opportunity for businesses to connect with their audiences, whether on-the-go or in the moment. They ain’t shy about following brands. Yet another stat proving Instagram means business. More reason for B2C companies to get on the platform. …like visiting a website after looking at a brand’s post. Got good looking products? Instagram is the place to show them off. Over a third of Instagram users have used their mobile to purchase a product online– making them 70 percent more likely to do so than non-users. …dwarfing the other networks, including Facebook with its 0.22 percent rate. Instagram is the engagement king. How many more reasons do you need to hear, to engage on Instagram? Don’t answer that. Rhetorical question. If your business needs help with social media marketing in McKinney, TX. and Frisco, TX., please call us at (469) 907-1057. Luce Media has deep expertise in Digital Marketing, B2B Marketing, Internet Marketing and is a well-established Digital Media Consultant in McKinney, TX. Please follow us on Facebook, Instagram, and LinkedIn to continue learning. Social media is the perfect place to promote your business during the holidays. People are looking on Instagram, Pinterest, Facebook and Twitter for gift ideas and great deals. With the right social media marketing strategy, you can boost holiday sales, engage with potential customers and spread holiday cheer. Here are five tips on how your business can use social media to boost sales this holiday season. 1. Use Facebook Live, create events and run giveaways. Hosting Facebook Live videos is a great way to give your followers the scoop on your deals for the holidays, what new products you have or what services you’re offering. One big benefit of using Facebook Live is that you are guaranteed to get more reach than with any other type of Facebook post. Facebook tells us you get as much as a 12 times the number of people as a normal post will get you. Check out our other blog on 10 Things You Need to Know Before Going Live on Facebook by clicking here. Along with Facebook Live, you should also use Facebook’s events feature. You can create Facebook Events for any in-store events you might be hosting during the season. Once you’ve hosted a live video or created an event, be sure to continue to post all your promotions on your social accounts. Another great way to engage and connect with your followers is with a giveaway contest. People can use a little help this time of year and the chance to win a big gift that someone on their wish list may appreciate is a very attractive prospect and grabs quite a lot of attention. 2. Use Twitter polls to identify customer pain points. Social media platforms are constantly updating and adding helpful features. From Instagram questions to Twitter polls, there are a range of ways to easily engage and connect with your followers online. You can use those features to identify pain points and then provide a solution. If you can identify a problem your customers are facing and solve it for them, you will create customers for life. Introduced in 2016, Instagram Stories quickly became a popular social media tools and marketers need to take advantage of this feature this time of year. Today, Instagram Stories are the most engaged platform of all social media platforms. Stories have nearly taken over the Instagram platform with their temporary availability and features that allow for product-feed integration and swipe-up to shop, simplifying the purchase experience for users. And don’t forget about Highlights. Your temporary content can be saved to Highlights on your profile for the duration of the holiday season and removed come January. While focusing on Instagram stories doesn’t mean you should forget about posting a regular picture, it does allow you to supplement your content and post more frequently. Not convinced that you need Instagram stories for your business? Check out our blog post on why Instagram stories are crucial for small businesses, here. 4. Engage with followers and get creative. While you use social media to market your business, your followers use it to have fun and engage with their favorite brands. Being creative on social media such as running a contest, creating a holiday playlist for your business on Spotify or offer holiday tips is a great way to boost your business. Tips for the seasonal holidays or winter season in general make excellent social media posts. Whether you are discussing holiday safety or decorating tips, the holidays are a great time to give your business a personal appearance and voice. When you’re creating your company’s social media strategy, it’s important to keep in mind why customers are on the platform. Try to avoid being too salesy. Be the type of business customers ‘know, like and trust’ and have fun with it. After all, if you’re not enjoying the process others likely won’t either. Many of us like to decorate our home or office to get in the holiday spirit. It’s a good idea to give your online presence a similar type of makeover by applying holiday themes to your website and social profiles. Adding small touches to your website with holiday-themed graphics and colors helps signal to your customers that the season of giving is upon us. Bright, engaging colors and animated GIFs tend to work well. Though the holiday season is in full swing, there is still time to boost your social media marketing efforts and earn customer loyalty by improving the way you interact with them on the various social media platforms. Leveraging the power of social media marketing is vital for increased sales, satisfied customers and a whole lot of holiday joy. Even when it’s not the holidays, your company’s social media presence is extremely important to the success of your business. At Luce Media we have all the tools and more to make sure your social media success lasts year round. Check out our social media services and then schedule a time to talk about how we can boost your business. From everyone here at Luce Media, we wish you a safe and Happy Holidays! This information was originally posted here and here. For a l ocal business that wants to get discovered in search results, maintaining an accurate Google My Business listing is critical. The listing details (such as the business’ phone number, website, photos, and hours of operation) determine what information consumers see in Google Search and Maps. Business owners need to take control of the company’s Google My Business listing to ensure up-to-date business information is displayed online. This means creating or claiming the business listing on Google My Business and optimizing the content to ensure accuracy and improve visibility. Here are 6 Steps to claiming and optimizing a local business listing on Google My Business. The first step is to find out if the business already has a Google My Business listing. Google often generates listings based on information available online, which may or may be fully accurate. An existing listing should be claimed so the information can be updated and kept accurate. A simple Google search for the company name can reveal whether or not a Google My Business listing already exists. If a matching listing appears in search results, there should be a link that says “Are You the Business Owner” next to the listing. If, however, the business does not show up in search results, it’s important to create a new Google My Business listing and update it with correct information about the company. If the “Are You the Business Owner” button is not visible, then the listing has already been claimed. Talk to any partners, owners, or marketers involved with the business to find out who has claimed the listing. Double check if there is another Google account linked to the business. If you can’t figure out who verified the listing, you’ll have to go through Google Help to gain access. Once the business has been verified, you can easily edit and update the business details that will show up in search results. It’s crucial that the business’ name, physical address, and phone number (NAP) are consistent across the web – so the NAP data in the Google My Business listing should exactly match what’s on the business’ website. It’s highly recommended that if you need to make changes to the listing you make those before requesting the verification from Google. If you make the request and then make a change, you’ll quite possibly have to make a second request to get the listing verified. Customers and search engines both prefer business’ that accurately represent themselves online. So when selecting a category for a company’s Google My Business listing, it helps to be as specific as possible. Even if the business falls under multiple categories, it’s best to select the single most relevant category to describe the products or services offered. If you aren’t sure which category is the optimal choice for a particular business, search for similar companies on Google to see what categories they’ve selected. In order to provide customers with more context in search results, Google likes to display images next to business listings. Google My Business listings with photos receive 42% more requests for driving directions as well as a 32% better click-through rate to the company’s website. If the business doesn’t upload official images, Google can display photos uploaded by the public – which can sometimes result in embarrassing mishaps for the business. Although a business can suggest a ‘preferred photo’ for search results, Google will only use the recommended photo if it truly represents the business. Upload high-quality photos that give an accurate impression of the store location. Use real pictures of products sold by the business. Keep Google’s recommended file size (between 10KB and 5MB) and minimum resolution (720px tall, 720px wide) in mind. Don’t use stock photos or text-based images. Keeping the Business Hours Up-to-Date: Google displays hours of operation to tell consumers whether or not the business is open at the time of their search. Remember to update this information if business hours change during the holiday season. Collecting More Customer Reviews: Encourage customers to leave reviews and take the time to reply when they do. Adding a Description on Google+: Although businesses can no longer edit their descriptions on Google My Business, this field can still be viewed and edited on Google+. Whether claiming an existing Google My Business listing or creating one from scratch, use the above tips to ensure accurate information shows up the next time a consumer searches. Keep customers happy, keep Google happy, and increase local visibility. Need help claiming, creating, or optimizing a Google My Business listing? One location or one thousand, we have you covered! Why Google My Business, Google Maps, and Online Reviews are CRUCIAL to your business? Here’s What You Need To Know. Google My Business provides you with the ability to list your business location on Google Maps and local search results. You can display valuable and key information about your business, including the opening/closing times, contact phone number or a link to your website. You can display important information about your business, including the opening/closing times, contact phone number or a link to your website. More recently Google has also released a new feature allowing you to post a link to articles or up and coming events. When it comes to reviews – here is the bottom line. The quality and quantity of reviews on Google is one of the most important ranking factors for local SEO. And, when a person scans the search results for a local product or service in Google, the business listings that include customer reviews present greater credibility and, naturally, receive more clicks. Watch as Mark Toney, CEO of Luce Media talks about the latest information for small to medium-sized businesses in completely filling out the information on Google My Business as well as the importance of soliciting Google Reviews for your business. We can not stress the Importance of Google My Business, Google Maps and Good Reviews for Small to Medium Sized Businesses. This is just one of many of the aspects we focus on for your business -and encourage YOU to look at all these variables. Do you want to GROW your business? Do you want more online presence? Luce Media works strategically helping all of our clients grow. Get started today with our FREE Social Media Analysis. We analyze your website, all current social platforms you are on plus tell you immediately what your Online Visibility looks like. I guarantee you will learn key elements to grow your business. And it is FREE. Since its launch in April 2016, Facebook Live video has swept the world. As a platform, Facebook Live has unparalleled reach when it comes to reaching fans organically. Facebook’s News Feed algorithm highly prioritizes Live video, meaning your followers are way more likely to see one of your Live videos than any other content you post. That’s why it’s not a half-bad idea to consider making Facebook Live a part of your social media marketing strategy. You might be wondering where to start and what to do. That’s why we’ve put together this list of 10 Things You Need to Know Before You Go Live on Facebook! While celebrities, influencers, and more prominent brands have the gravitas and fanbase to use Facebook Live for more casual purposes, like broadcasting their surroundings or going Live for a few minutes at a time to interact with fans, chances are you don’t have the same resources. Because of this, you need to focus the time you spend on Live. Ask yourself what goal you’re trying to achieve with the video, as well as if and how the broadcast will help you make it. If you can, try to choose an objective that’s more specific and results-driven than “social engagement” or “brand awareness.” Though these things are great, they should be secondary to other goals like lead generation or sales. Once you and your team have settled on an objective, plan your video with that objective in mind. It should reflect in the topic you choose, as well as the way you present it. For example, if we were putting together a Live video for a fitness center that wanted to highlight the benefits of personal training, we might choose to do a Live Q&A with one of our trainers, showing off his knowledge and encouraging viewers to sign up for a training session. Even though Facebook Live is relatively spontaneous as far as content mediums go, it’s still a good idea to craft at least some sort of outline, depending on the intent of your video. This goes hand-in-hand with having an objective in mind, like the way you organize your speaking points should point Live viewers towards your goal – don’t go Live for the sake of going Live! Before you go Live, outline your talking points and go over them with your co-host (assuming you have one). Get at least a rough idea of what you want to say, as well as any specific points or examples you’re sure you want to include. My colleagues did a Live video a few months back about using content upgrades to generate leads for our sales team. Though it wasn’t without its hiccups, one “victory” of the broadcast was the way we organized it. It was clear and structured, highlighting the different steps of the process and the tools (within our product) viewers could use to generate leads for their own team. Having an organized outline based on the goal of communicating the value of Wishpond and driving signups helped immensely with the quality of our broadcast. That being said, don’t be afraid to go off-script – it is Live, after all! Be loose and have fun with it! Even after you’ve announced your live video, many of your would-be viewers won’t show up right at the start of your broadcast. Because of this, you’ll want to put together some sort of pre-show to fill time in your Live broadcast leading up to the start of your presentation (whatever that may be). Don’t jump right into the meat of your content the moment you go Live. Either go Live 15-20 seconds before your scheduled start time to let people come in as they get notified, or start on time but don’t get into your content until a decent amount of people join your show. You can do a couple of different things for this “pre-show” portion. If you’re not up to entertaining, feel free to pop in a countdown timer to get people ready and waiting. If you do feel like interacting (and we recommend you do), talk to your viewers. Welcome them to the broadcast, answer their comments, and get them excited for the show to start. This is also a prime time to get your viewers to share your video – remember, Live videos get a massive boost on News Feed placement, so getting your fans to share your Live broadcast can significantly increase its organic reach. One of the principal benefits of Facebook Live is the fact that it allows you to interact with your fans in real-time, meaning you’re about as close to face-to-face as you can get without actually meeting them. Though it’s not necessary, we’d recommend you put at least some effort into responding to fan comments and answering questions! It’s an easy way to make your Live broadcast super engaging, and it makes fans feel appreciated, meaning they’re more likely to stick around and watch. At the start of your broadcast, greet people by name as they join. You don’t have to get to every single person, but acknowledging your viewers gets them pumped up for the upcoming broadcast. As far as questions go, we’d recommend you set aside breaks in your broadcast or save for them the end, as opposed to answering them on the fly, which could put a serious wrench in your broadcasting flow and make your broadcast feel disorganized. A Live video is a special occasion, and as far as promotion goes, you’d be well off treating it like a webinar. By this, we mean you should put as much effort as you can into getting as many people as possible to show up for the Live broadcast as people, even though they’ll be able to watch it back later once the replay has gone live. Send an email: One benefit of having a mailing list is that you can reach out to them in cases like this! Send a simple newsletter a week or so before your Live video to your subscribers, linking them to your Facebook profile and letting them know when they’ll be able to catch you going Live. Post on social: If you’re doing a Live video on Facebook, it makes perfect sense to promote it there, as well. Create a set of posts that count down the days to your Live broadcast to remind fans to tune in. Advertise! : Though you can’t boost a live post, you can boost an announcement in the days leading up to it. Though it’s not a sure-fire way to get people to watch as you go Live, it opens the door for new potential fans to check out your broadcast. Go Live beforehand: Do a short Live broadcast informing viewers that you’ll be going Live in the next few days. Though this might seem silly, Facebook’s News Feed algorithm heavily boosts Live video, meaning more people will see it. 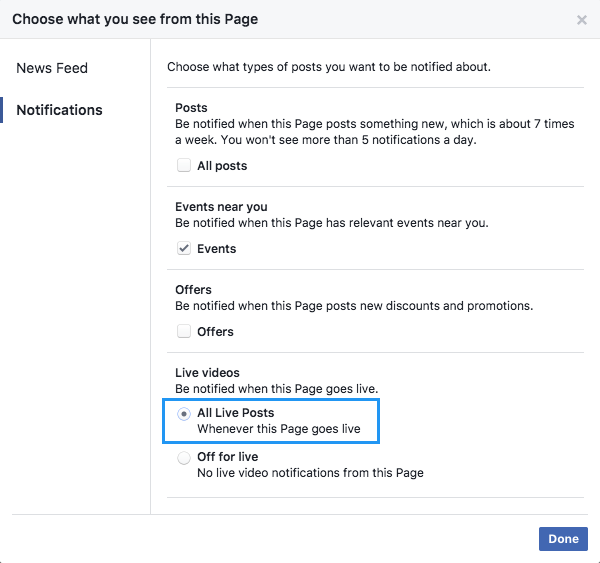 On top of that, you can prompt viewers to turn on Live notifications for your Page so they are reminded when you go Live next (and in the future). Live Videos are unique in that people can join anytime during the broadcast. It’s great in the sense that people don’t need to be ready beforehand – they can jump in as soon as they see it on their News Feed. On the other hand, it can be tough as a content creator because people who join your video late might not be able to follow what you’re saying. Because of this, it’s important that you periodically recap what you’ve been talking about as you go. Every so often, you can say something like “if you’re just joining us now, we’ve been talking about [recap].” This will help retain viewers who may otherwise leave because they have no idea what you’re talking about. There’s no worse feeling in a Live broadcast than having your audio or video randomly cut out, or watching your broadcast back and realizing everything is blurry, or you can’t hear anything. Luckily, these are all issues you can easily avoid! Before you double-check your setup, put some effort into making it as good as possible. Aim for high quality and reliability – an iPhone 7+ camera might be better than your 2012 MacBook’s webcam, but it also has a higher chance of dying while you’re broadcasting. Pick a reliable setting as well – bright, solid-color backgrounds work great (see below). If you can, do a practice run-through with all of your hardware to make sure it’s all working. Adequate lighting: Making sure your subjects are well-lit means you’re not left with two silhouettes on an overexposed background. Use some additional lights if you need them. The sound is everything: Seriously. People can deal with 360p video (remember 2008? ), but if they can’t hear you, they’re going to leave. I guarantee it. If you can, use an external mic (like a USB condenser mic) for your audio – it’s dozens of times better than your laptop’s built-in mic. Use a tripod: Unless you’re live-streaming an event, you want your video to be as steady as possible. Thankfully, a tripod takes care of this easily. Though we don’t condone or recommend it, there is a way to stream a Facebook Live video without actually being Live. Without going too far into detail, Facebook allows you to broadcast Live to your page using an external program, such as Open Broadcasting Software (OBS). Because OBS can stream video and audio from a number of sources, you could technically stream a pre-recorded video to Facebook Live using the software, just as Tesla did in the example below. Third-party broadcasting programs like OBS can also be helpful if you’d like to edit your videos slightly before they go Live. These cases might include adding overlays (like logos or graphics, as you can see below) or if you’re just not sure you’ll get it right on the first take. That being said, don’t chop up your video or stream a professionally edited video as if it’s Live – your fans will know, and they probably won’t like it. If you’re considering making Live video a big part of your social media marketing strategy, it’s essential to maximize the number who show up to your broadcasts. One way to increase the chances your fans will tune in is to get them to turn on Live notifications. We touched on this earlier in the article, but it’s important enough to merit its own point. We’d create a post or graphic with the following information, and maybe append it to your Facebook Live announcement mailout, too. And that’s it! It’s super simple, and you now have the benefit of having your fans be notified every single time you go live. This increases the effectiveness of future Live broadcasts, too, and your viewers only need to do it once (though we’d add this information to every Live announcement for new fans or people who haven’t already done it). Finally, add some sort of CTA to your Live broadcast. This is a tactic that will give you the best chance at generating some kind of immediate return on Facebook Live. Either add an “ask” to the end of your video (or sporadically throughout it) to direct viewers towards your ultimate goal, whether that’s your e-commerce store to get them to buy the product you’re highlighting in your video, or to a sales page to get them to book a call. One great way to add this without needing to bring it up during your video continually is to use OBS (or another software) to add it to your broadcast as an overlay. Make it unobtrusive, so your video is still the primary focus of the broadcast, but visible and enticing enough that people will act upon it. Either way, make sure you give viewers an avenue to convert in some way – trust me, driving a sale or demo from a social media marketing strategy is a good feeling. There you have it – 10 awesome tips and strategies to think about when you’re planning your next Facebook Live video. Hopefully, you’ve learned something new about this rapidly growing video format! If you have any questions about Facebook Live (or just Facebook in general), we’d be more than happy to answer them in the comments below. High-quality marketing is expensive. However, it doesn’t have to be. Thanks to the Internet, the playing field has been significantly leveled for a small business, which now has access to the reach and influence formerly only reserved for the big brands. There are actually many low-cost methods for reaching out to your customers and spreading the word about your business. Here are 20 creative options to market your business online on a budget that you can try. Contests are a fun and highly interactive way to get greater visibility for your small business. Some suggestions include caption contests and giveaways. Caption contests are good for a laugh and you can provide a small prize for the winners. Giveaways are great for growing your e-mail lists via the entry form. Polls are also helpful because they not only draw attention to your business and its plans but also provide you with valuable data. Pursuing guest post opportunities is an important way for a small business to grow your influence without spending any money. You may even get paid for your content. These posts benefit both parties because they give the host opportunities for new, unique content from different contributors and they benefit you by reaching a wider audience. Quality backlinks from these sites will also improve your search engine rankings, giving your business further exposure. It costs nothing to offer advice or answer someone’s question. Doing so will establish you as a knowledgeable professional and help you gain the trust of clients. Sites like Quora and Reddit are full of people with questions. Answering a question also offers longevity. These questions and your answers remain up on the site, so anyone looking for a similar answer in the future is bound to stumble across it. This is really a great way to market your business online on a budget. Why? Because this will show your expertise in your industry, you might become a thought leader if you’re consistent and this will help you generate leads. Customers use these directories when looking for a business, and so it is important to make sure your company is listed on them. Heavily trafficked sites to list your information on include Facebook, Google My Business, Yelp, Angie’s List and Apple Maps. These sites are free to list on, although you may need to meet some of their requirements first and prove your business is legitimate. Luce Media has a very cost-effective program to get your business on the top 50 online directories. To check what your online visibility looks like, click here. Industry groups and communities are very helpful places for building your network, growing your authority and both giving and receiving advice. There are industry-specific groups present on sites such as LinkedIn, Facebook, and Google Communities on Google+. If you can establish yourself as a helpful contributor to these groups, your influence and reputation will grow. You never know what kinds of cool insider tricks you may learn as well. Pinterest, like many social media sites, is free to use and should not be underestimated as a significant marketing force. It is especially useful for sharing images of your products, displaying infographics and driving traffic to your site by linking to it from the image. Pinterest is a great channel to grow and what’s amazing about it is that marketers don’t use it that much yet. This is why Pinterest is a great way to grow your business online on a budget. Visual media tends to attract the eyes of customers more often, so one of the largest image sharing sites on the Internet should not be overlooked. A staggering 87% of Pinterest users have purchased a product because they saw it or heard it recommended on Pinterest. If you don’t have one already, you should work on forming a referral program within your company. This encourages your loyal customers to spread the word about your business and bring in more customers. According to Nielson, 84% of customers around the globe believe that friends and family are the most trustworthy sources of information about products. Referral marketing is a cost-effective growth strategy that can bring you explosive growth. There are many referral marketing examples you could get inspired by. The interest of marketers has clearly been captured by social media. Facebook, for example, has 8 to 9 times higher click-through rates than regular web ads. Instagram is the fastest growing social platform out there today. But posting occasionally is not enough. It is equally important for a small business to give regular updates so users are continuously being reminded of your presence and what you do. I recommend any business of any sizes to have a large social media presence. Social media is inexpensive and is a great option to market your company if you’re on a shoestring budget. You should also get involved in the community, such as by participating in themed hashtag days, for example. You never know what other professionals and customers you might connect with. It shouldn’t come as a surprise that people love free stuff. Some people love it so much that they frequent deal sites. For example, if you are selling a book, giving away free books on a major platform like GoodReads will increase exposure for both your book and your company. Giving away occasional freebies also gets your products into the hands of potential customers and may win you loyal fans. A post consisting of interesting statistics about your industry is a relatively easy way to drive traffic to your blog. People find statistics interesting and love to share them. You don’t even have to go out of your way to do this – it can come naturally from market research you have done or other high authority sources of information you came across while learning more about your industry. Interviewing experts in your field is another way to increase your authority. You can interview them with set questions, such as over e-mail, and write up the interview in a blog post to share. The people you interview will also likely post your interview, which shares it with their followers and widens your reach. This is one of my favorite ways to market your business on a budget because by interviewing experts in your industry, not only you’ll leverage their community, you will also connect with them. There are always people looking to get started in your industry, whether as an employee or an entrepreneur. Writing how-to guides and ebooks for this audience can be a significant source of income as well as grow your influence and establish you as a professional in your field. You might not have the time for this, so it might be worth looking into hiring a ghostwriter. Remote collaboration between content editors and ghostwriters is often highly successful. In your e-mail signature should be your name, what you do, your contact information and links to your website. You can also include your company’s slogan and social media accounts. Make it colorful, eye-catching and interesting. This reminds or announces to anyone you contact this way that you exist, and thus serves as a good marketing tactic. Your email signature is just one email marketing tactic. You’ve got a lot of email marketing strategies you can integrate into your campaigns. Plus, email marketing has a great ROI! You have probably noticed how often major companies have sales, which is at least a few times a year, if not more. They do this for a reason – it works. Customers are more likely to take a chance on a new product or service when it is on sale. As a small business, you need to plan your sales carefully and space them evenly throughout the year. For example, discounts at specific times of the year, namely holidays, are popular. For online businesses, participation in Cyber Monday in November is practically a must. If you provide a service, whether you are a personal trainer or an attorney, offering free consultations is a great way to bring people in. They can then meet you and see if you can provide what they need. Use this opportunity to impress them so they will want to go forward with working with you. You likely read many blogs to stay up to date on what is going on in your industry. Simply leave comments and start discussions about these posts. Doing so shows that you are actively engaged in the community and lets other users know that you are a professional. So, how to market your business online on a budget? Effective marketing is not just about the money. To be successful takes a lot of time and effort. Plus it helps to understand the latest opportunities that digital marketing and social media marketing have to offer. At Luce Media, we encourage your small business to focus on what you do best and let us do for you what we do best. Never stop looking for new and creative ways to reach your customers, and you will find a winning combination that works for you. Luce Media specializes in helping businesses on a budget grow. We use growth hacking, digital marketing, data, product development and a lot of creativity to do so. If you want to see your business reach new heights, give us a shout at Luce Media now and we’ll start growing together! We provide digital marketing and social media marketing in McKinney, Frisco, Plano, and Allen. Every business wants to be seen. In this day and age, the best way to get noticed is online, especially through social media. Your online branding is important because it dictates who you are and what you do, and it’s the first thing any potential client will notice. If your small business is selling services or products to other businesses, then LinkedIn is a social media platform you must be using. Facebook, Twitter, Instagram, Google+, and LinkedIn are the main social media platforms, but the latter – LinkedIn – is one of the best forms of social media businesses can use to, not only to network with like-minded business people but also to help with their online branding as well. There are a variety of ways social media can benefit businesses, but why LinkedIn? This is because it is considered business social media, which allows businesses to interact professionally online. And to stand out, you must craft a profile that stands out. LinkedIn is based on business connections. All of the connections you have are considered 1st level connections. Anyone connected to them is 2nd level and then connected to them are 3rd level connections. This shows how wide-ranging this social media platform is, and the opportunities are endless. LinkedIn is the number one business social media platform, with over 500 million members worldwide. It is considered a professional tool used by many companies in a variety of sectors. It essentially exists to look like an online CV or resumé, which allows professionals to seek out new opportunities. But it’s also beneficial to companies, not just as a recruitment tool, but to exist solely as a brand on the social media platform. A profile consists of several scripts (summary, experience, education, etc.) and the written content in each one can reflect the business as well as the individual. As a member on LinkedIn, you can make connections with your connections (i.e., 1st, 2nd, 3rd level connections), and search for people who work in a sector you may be interested in. Mainly used for professional networking, LinkedIn allows professionals from any sector to find potential employees or potential business clients. It’s used by everyone and anyone in business who wants to be seen online and make strong business connections. With over 500 million people signed up, as of 2017, and 80% of B2B leads come from LinkedIn (statistic: LinkedIn, 2017), it has become the platform for professional business networking. The top 5 industries on LinkedIn are Finance, Medical, Educational, High-Tech, and Manufacturing, and 48% of all LinkedIn members use it at least once a day. (Statistic: SlideShare, 2016). Therefore, plenty of small business owners, managing directors, CEOs, etc., can be found networking on this business social media platform, so your online branding is important. Your online branding starts with visibility. How you look, or how you appear to others online. Using LinkedIn for your online branding is essential to be seen by professionals, or by people whom you want to see you. When using social media for online branding, you should be doing this for the promotion of your company’s brand and yourself as a brand. It’s all about identity – Who are you? What do you do? and Why should I like you? In doing this, it’s all about optimizing your LinkedIn profile with professionally written, SEO-rich content, that reflects the individual as well as referencing the company at the same time. Having that personal touch instigates the emotional side of the brand, as it moves away from a faceless, corporate entity. Social media marketing has made it essential now for businesses to have a personal touch to their visibility. Because the individual LinkedIn profile relates to an individual employee, it puts a friendly face on the company and makes it much more personal, too. LinkedIn is seen as the social media platform where businesses and professionals can network freely without having to travel anywhere. LinkedIn can help with your online branding primarily through visibility and recognition in a place where your reputation is at home with other like-minded businesspeople. There are plenty of benefits to having LinkedIn help with your online branding. It’s a powerful sales, marketing, and branding asset that can result in exponential business growth and profit. LinkedIn can help with your online branding because it’s an effective tool for brand awareness and brand promotion. The more visibility you and your company have on LinkedIn, the more people will know who you are and the positive impact you can have on their working lives. More connections mean more money. This is because the more businesspeople you network with online, the more likely you are to generate leads. Lead generation can be turned around to potential clients and business, and it’s from this where businesses progress, move forward and achieve the success they set out to achieve. Businesses can gain quality leads simply through networking with other businesses online. So, get a professional-looking, well-written profile with a quality photo; network with your connections and on groups; share content consistently; and interact with people to show, not just what you sell, but who you are as a brand. Which content marketing tactic can hold an audience’s attention for a half hour or more at a time? Which tactic inspires an audience to subscribe to your content and make a regular appointment to consume it? Name the tactic can help boost thought leadership, raise awareness and engage influencers in your industry? Do you know which tactic is in the title of this blog post? While there are many great marketing tactics which go beyond the written word, the answer, of course, is podcasting. These long-form audio programs first emerged in the early 2000s. Back then, they were a niche format for hobbyists and tech nerds (like me). But the rise of the smartphone brought podcasts to the masses. Now, there are hundreds of hours of programming available on every conceivable subject, in every genre from real crime to horror to musical. But we haven’t hit content shock for podcasts — it’s still a growing market. If your business is looking to boost thought leadership and reach a new audience, now is the perfect time to add a podcast to your content marketing mix. Here’s what you need to know to get started. They’re organized in an RSS feed where you can subscribe. Whatever genre the audio is, whatever platforms it’s available on, as long as you have multiple recordings brought together by an RSS feed, you have a podcast. Why Should Businesses Care about Podcasts? The way that people consume podcasts makes them an ideal channel for your high-quality content. People tend to listen while working out, driving, cooking dinner — in other words, podcasts fill sizable chunks of otherwise idle time. You wouldn’t expect someone to read your white paper or eBook during their morning commute, but they might settle in with your latest episode. In other words, your target audience is likely spending a significant amount of time listening to podcasts already. And those who already listen to at least one podcast are likely to be on the lookout for more. What Goals Does A Podcast Serve? Podcasts work best for the attract and engage phases of the customer journey. You can use your podcast to build brand awareness and establish thought leadership in your industry. Thoughtful, valuable content can help your brand stand out from the competition, and encourage listeners to make a relationship with the brand. The most successful podcasts tend to be in the Q&A or panel discussion style. Hosts can welcome new guests each week to share their insight. This type of format is perfect for influencer marketing: You can boost your internal subject matter experts, form relationships with influencers in the industry, even feature your potential prospects. Since podcasts have a low barrier of entry, they are an excellent way to reach a niche audience, too. Podcasts succeed because they do what all great content does: deliver valuable information to a specific audience in an entertaining format. It’s never been easier to launch a podcast. Got your first podcast created? Now what? Here is a list of places you can post your podcast to – some free – and some not. Podcasts are a rare type of content marketing: Interest in them is steadily growing, people go out of their way to seek out new content, and they’re relatively cheap and easy to produce. B2B marketers are continually challenged to deliver the right content to people in the correct format to earn their attention. If your target audience has a morning commute, a workout schedule, or other quiet time to fill, your podcast may be just what they’re waiting for. More customers are actively searching for small businesses online than ever before. Google processes over 3.5 billion search queries per day, over half of which take place on mobile devices. That’s a lot of on-the-go mobile shoppers looking for nearby stores. But that traffic is worthless to businesses that fail to optimize their local search. Improving your business’ online visibility and placement in search results is one key to attracting more local shoppers to both your website and your small business location. That said, local competition can be fierce. Small businesses that want to connect with local consumers online can’t afford to make marketing mistakes that place them at a disadvantage. Although there’s no perfect formula for dominating local search, there are certain mistakes that you must stop making to keep from sabotaging your own visibility. Today, we’ll examine the most common mistakes and what can be done to remedy them. Done right, content marketing can be a powerful tool for local businesses. Publishing consistent content allows you to tell your brand story and educate consumers about products, news, and trends, all while establishing your small business as an industry leader. Quality blog posts also help search engines learn more about your company, which can lead to increased credibility and higher rankings in search results. To be specific, Google loves E-A-T content — content enriched by the author’s expertise, authority, and trustworthiness. Local small businesses need to take it a step further and realize content is most effective when it has a bit of local flavor. A local perspective can infuse blog content with personality, make it more relevant to readers, and help the business build a stronger connection with local customers. Gone are the days when those scoring the most backlinks are guaranteed to come out on top. Backlinks are the number of other websites that have a link in them pointing to your small business website. Sure, having lots of citations and backlinks pointing to the business’ website can still be great for SEO, but only if the sources are authoritative and credible. Businesses that invest in high-quality link-building and submit listings to respectable local directories will see a boost in their online visibility. However, search engines do notice when a site receives most of its traffic from untrustworthy sources, which can result in lower search rankings. Luce Media has a very cost-effective program to get your business on the top 50 online directories. To check what your online visibility looks like, click here. Instead of trying to get as many backlinks as possible, focus on earning high-quality citations from reputable sources. The citations themselves should offer up-to-date information, and the business’s name, address and phone number (NAP data) must be consistent across the web. Just remember: Quality is more important than quantity. The online visibility of any small business is essential for getting found by consumers in this digital age and, if there is bad data, duplicate listings or no listing at all, then small businesses are losing customers. Luce Media has the tools and the technology to make sure your small business is highly visible online. Online visibility is not a “one and done” process. A small business’s local presence must be monitored, maintained, and adapted based on algorithm changes on a consistent basis. Contact us here at Luce Media to find out how we can help you improve your SEO and be found more often in Google searches. Luce Media helps companies in McKinney, Allen, Plano and Frisco with social media marketing. Written by Bernadette Coleman and originally appeared in Advice Local’s blog.